The teaser plays on the title of George RR Martin's A Song of Ice and Fire. One would not be a Game of Thrones fan if they have not been waiting with bated breath for the new season. As for the fans, the light at the end of the tunnel can finally be seen. 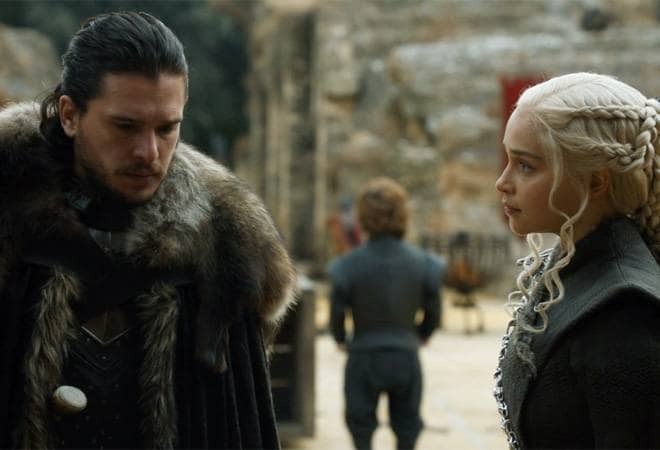 HBO released the first teaser for Game of Thrones Season 8. And perhaps this teaser also holds a lot of meaning for the fans as this is the cult show's final season. While the teaser in itself does not show anyone or any footage, what it shows is indication of what is about to come. The teaser plays on the title of George RR Martin's A Song of Ice and Fire. The suspense is palpable as a wave of icy wind clashes with fire. The icy wind engulfs a wolf and a dragon map marker - sigils of the Starks and the Targaryens, while fire engulfs the lion map marker - sigil of the Lannisters. This is also indicative of how Season 7 ended. Not only did the Night King take control of Daenerys' dragon Viserion, he is also moving towards Westeros with his army of White Walkers. As he marches towards Winterfell, the reunited Starks have a lot more to endure in the future. It must also be noted that there are two fire dragons and one ice dragon now. The clash between them is inevitable. The wait till April 2019 suddenly seems very long.